In the same fashion the sous vide has invaded kitchens everywhere, pressure cookers are yet another viral cooking hit. At some point, and especially during these colder months, we all crave a hearty, slow-cooked meal. And even though slow cookers are a trusty kitchen staple, not everyone has the time or patience to wait 8 hours for a pot of chili—Enter the pressure cooker. A pressure cooker uses a air-tight, locking lid over a cooking pot to capture cooking steam, building immense pressure within the pot and resulting in lightning speed cooking. 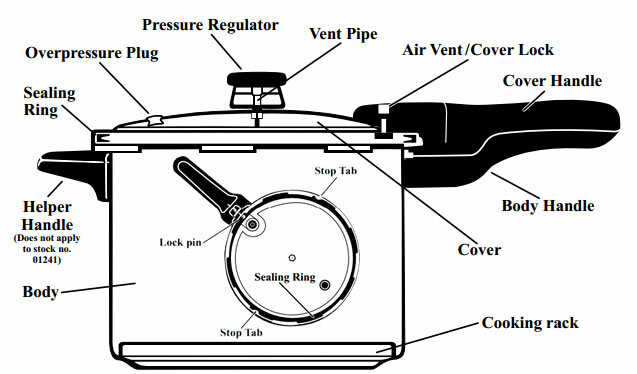 The components of a pressure cooker are virtually the same, whether stovetop or electric. 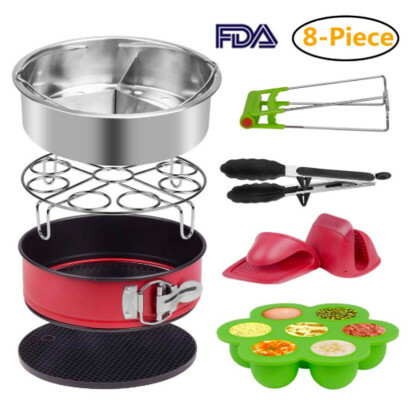 At the very basic level, you will have a deep vessel or pot that holds the food you will cook, and a screw-on, lockable lid with a sealing ring that seals the steam in. The pressure cooker lid includes a vent pipe and pressure regulator to release the pressured steam when the cooking is complete. The heat building inside the pot gets hotter than boiling. The hotter the pot, the more pressure inside the pot is created. And the more pressure that’s accumulated ultimately results in a shorter cooking time. For instance, a pot roast broiling in the oven or slow cooker can take up to 6-8 hours, versus 45 minutes in a pressure cooker. 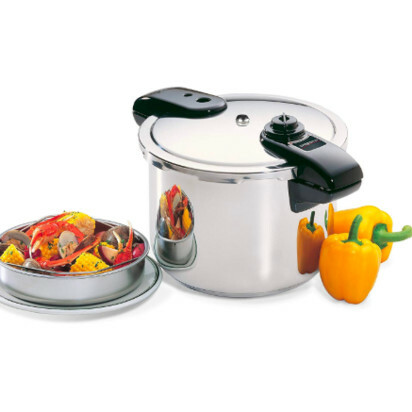 There are two main types of pressure cookers that can be found for home use: stovetop and electric. Before deciding on which type of pressure cooker is best for you, let’s weigh the considerations, pros, and cons for each. Before the days of electrical gadgets, stovetop pressure cookers were the tool of choice. They’re a little bit bulkier than a stock pot, and can be stored in the same place as general household pots and pans. They’re easy to assemble and use, use the heat from a stovetop to cook, and don’t have any electrical cords or digital hardware to maintain. However, stovetop pressure cookers have limited functionality. With the stovetop variety, you’re pretty much limited to sautéing and pressure steaming. If you don’t envision yourself using your pressure cooker for slow cooking, rice cooking, or yogurt-making (seriously! ), then a simple stovetop cooker might be what you’re looking for. Stovetop pressure cookers can be intimidating for those new to this cooking technique, however. The onus is on the chef to monitor the temperature of the pressure cooker, and make sure the pot sealed correctly during cooking. The last thing you want is an explosion of hot steam in your kitchen. Prevent accidents by being especially careful opening the lid with thick and/or oily foods. You should also give your food enough time to rest even after all the steam has been released through the vent pipe. Better safe than sorry! By carefully reading recipes and instructions, and with a little practice, anyone can master the stovetop pressure cooker. There are entire social media accounts and blogs dedicated to electric pressure cooking (ever heard of the Instant Pot?). With the recent virality of the Instant Pot, we’d be surprised if you haven’t considered adding one to your kitchen repertoire. The Instant Pot, and other varieties of electric pressure cookers, have a slew of functions, programmed settings, and even sizes. You can expect to find settings for steaming, sautéing, slow cooking, rice cooking, and many more. In general, the box will contain the pressure cooker, a removable pot insert, a locking lid, and an instruction/recipe book. Some models may include add-ons like steam baskets and stirring spoons. 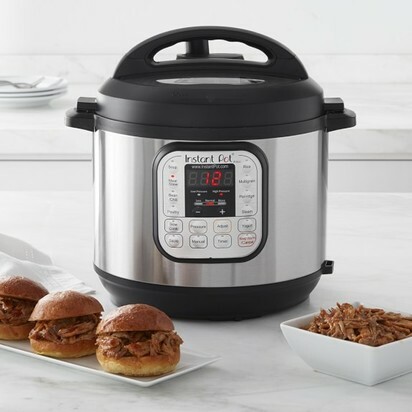 Electric pressure cookers are a fantastic option for those who want the convenience of several small cooking appliances, but don’t necessarily have the space to store all of them individually. Better still, electric pressure cookers regulate their own temperature settings and work without a stovetop directly on your kitchen counter. There are a few downsides to electric pressure cookers, however. The price tags, with good reason, are significantly higher than the stovetop varieties. No matter what type of pressure cooker you opt for, using them properly and safely should always be at the forefront of your mind. Electric pressure cookers have so many functionalities that it can be overwhelming to read through the instruction manual. This is one appliance, however, whose instruction manual shouldn’t be glossed over. Even though the lids lock in place until the all the steam has been released, users should still exercise caution. Pressure cookers, no matter how you slice it, get really hot. One should always be careful. 1. There are a lot of nooks, crannies, and extra parts that if not properly cleaned, can build up stains, odors, and even transfer to other foods you cook. 2. 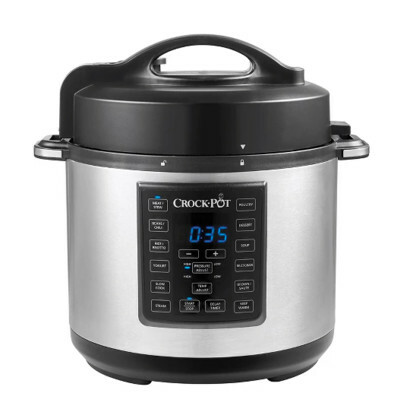 It extends the life of your likely expensive pressure cooker. Most stovetop cooker parts are dishwasher safe. Virtually every electric pressure cooker has a removable lid and cooker pot that can be cleaned in the dishwasher, as well. But even throwing the lids in the dishwasher may not be thorough enough. It’s especially important to clean the vent pipe on the lid of the pressure cooker after each use, stovetop and electric alike. Any sort of blockage in the vent pipe can prevent steam from escaping properly, and even cause explosions. We recommend getting your hands on pipe cleaners (yes, the ones from the craft store), and using them to thoroughly clean and dislodge food buildup in the vent pipe after each use. Proper cleaning techniques are crucial for any kitchen appliance, and it’ll extend the life of your products and make it worth the money spent. Luckily for us, the rise in pressure cooking means we get a bunch of add-ons and accessories piggy-backing off their popularity. 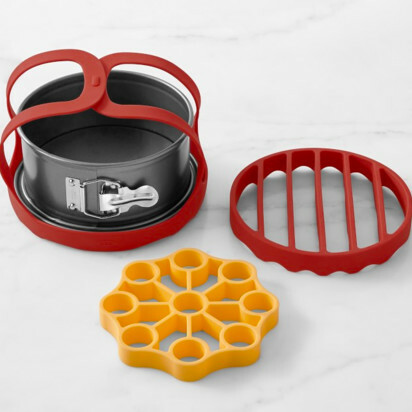 Didn’t know you needed a sous vide egg bites mold for you pressure cooker? Now you do! By now you may be convinced that a pressure cooker would be a great addition to your registry and kitchen. But if you’re new to pressure cooking, getting started may feel like a doozy. No worries, however. 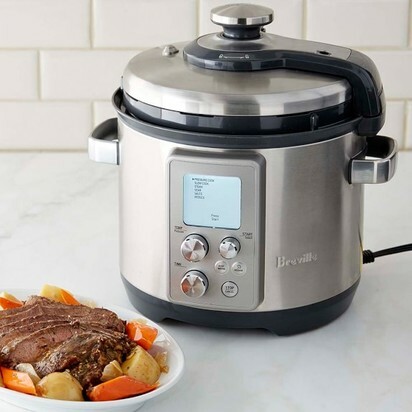 There is so much pressure cooking content and recipes available to help get you started, and of course, we have our favorites. 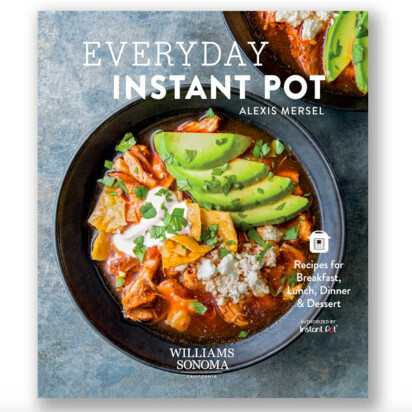 Williams Sonoma produces some of the best cookbooks out there, and Everyday Instant Pot is no exception. Don’t worry if you don’t decide on an Instant Pot, however. Once you become familiar with your pressure cooker (read the manual! 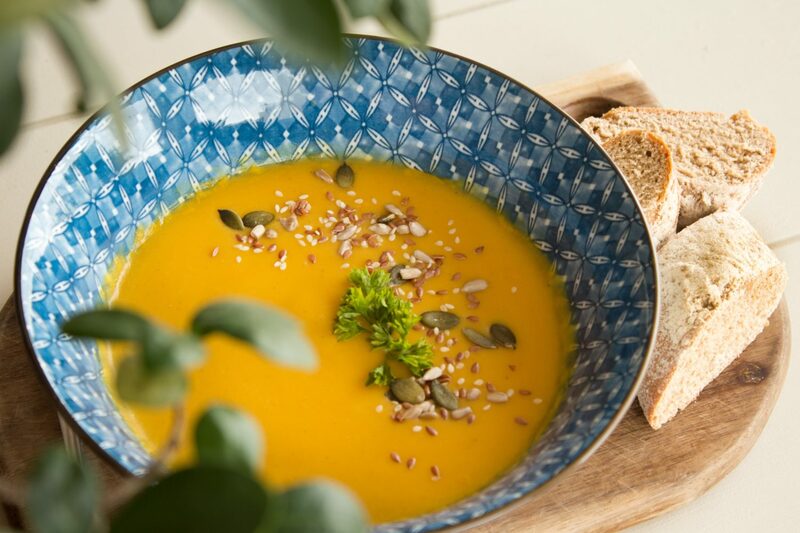 ), these recipes can be adapted to your cooker’s functionality. We love Extra Crispy’s recipes, and we especially love Kat Kinsman. Kat is arguably Instant Pot’s biggest fan, and her Instant Pot recipe videos are fun, hilarious, and approachable, with Kat’s signature quirky twist. How about sweet and spicy pickled fruit? We’re totally here for it. The Kitchn has a great selection of pressure cooker starter recipes and techniques. They’re familiar, delicious, and a great kicking off point for a lifetime of pressure cooked meals. While you’re there, check out their library of recipes and see if you would be able to adapt them to your pressure cooker. Oh, the possibilities! The revival of the pressure cooker, and it’s modern electric updates, are here to stay. Ultimately, people love convenience. If you could get a multi-function tool that cuts cooking times down to a fraction—all without sacrificing flavor—why wouldn’t you do it? No pressure, but we’re sure a pressure cooker is a perfect addition to any registry and any kitchen. Bon appetit! Ready to add a pressure cooker to your Blueprint registry?